Scoop up excess solids. DO NOT rub or scrub. Blot up as much liquid as possible. Use a clean white toweling or white paper towel. Apply spot removal agent to clean white towel (Not directly onto the carpet) refer to spot cleaning guide. Rinse with cold or lukewarm water. DO NOT saturate. Blot dry with absorbent material such as paper towel. Use a cool fan to complete drying. Every 12-18 months your carpet needs to be deep cleaned to remove all debris and greases. 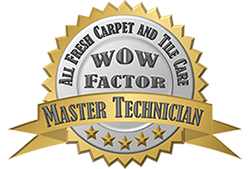 When it comes to professional deep carpet cleaning, All Fresh Carpet and Tile Care is here to help you. We have the best and latest cleaning chemicals that are environmentally friendly and safe if you have kids or pets inside your home. We are experts in carpet cleaning methods and stain removal is our speciality. Be sure to call All Fresh Carpet and Tile Care today and we will handle all your carpet stains professionally and hassle free. All Fresh Carpet and Tile Care are the experts when it comes to stain removal, but immediate spot cleaning of spills and accident areas is very important. Use the following tips to clean up spills, and contact All Fresh Carpet and Tile Care when the stain is too tough or for a thorough regular clean. Having a clean carpet promotes a better and healthier living environment for you and your family. The challenge for most people is keeping the carpet clean. Professional carpet cleaning services are always available and you can just call them for an appointment but sometimes we don’t have the luxury to do that. For maintaining your carpet, here are some tips from your dependable carpet cleaning company, All Fresh Carpet and Tile Care. First rule in keeping your carpet clean would be prevention, and limiting the dirt accumulated by the carpet should be your priority. Make sure to set some rules inside your house (e.g. Shoes-off rule) or place a sturdy mat at the entrance to scrape off the dirt before entering your house. Vacuuming should be a daily task to prevent dirt from building up. Having stains in your carpet is unavoidable and stains can happen any time but can sometimes be cleaned using ordinary household chemicals. All you have to do is choose the right cleaning agent for the carpet stain. Detergent used for washing your dishes can also be used as a cleaning agent for your carpet. Detergents are perfect for stains of grease in your carpet, just mix the detergent with water and put it in a sprayer. Spray it on the affected area of your carpet and use a clean cloth to wipe the surface. A white vinegar and soda water mixture is perfect for cat urine and beer stains. Mix both ingredients in a handheld sprayer, spray on the affected area of the carpet. Soak the area for about 10-15 minutes then gently press the area with a sponge. Once the stain is gone, make sure to rinse it with water. Children and even adults loves to chew bubblegum but when accidentally stuck to our carpet it can be a big problem. Ice cubes can be used for these situations; apply the ice cubes to the affected area for about 30 seconds, after freezing the gum use a spoon to take out the gum and cut the strands of the carpet. 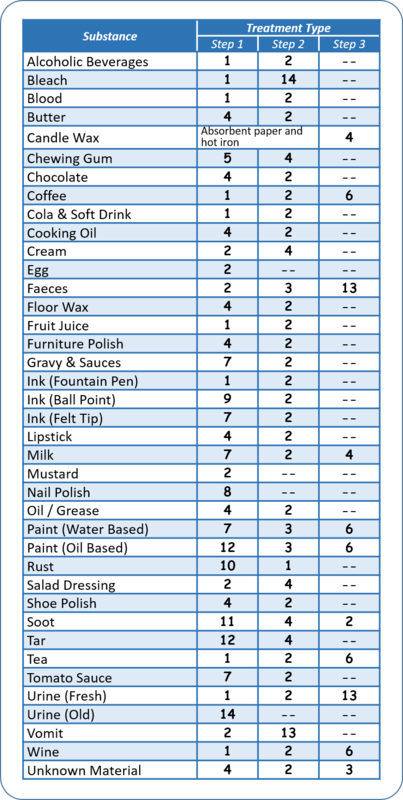 Rubbing alcohol can be used for cleaning mild stains like oily or waxy materials. Just apply a suitable amount of alcohol to the affected area and use a clean cloth or cotton to dab up the stain. The immediate treatment of spills and other accidents can prevent permanent damage to your carpet. 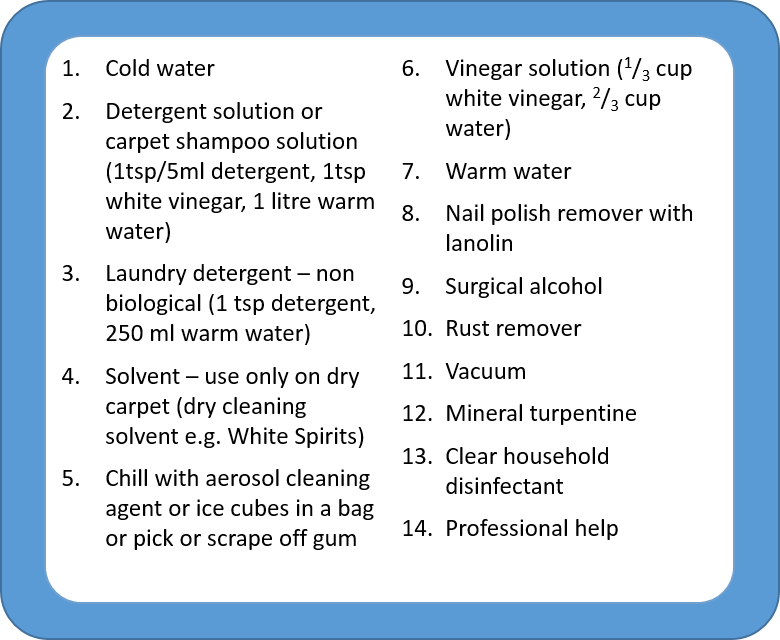 Follow these simple steps, but remember to call All Fresh Carpet and Tile Care for a more thorough treatment.